A good tummy tuck plastic surgeon is hard to find. Finding a good tummy tuck plastic surgeon in your area with all the right experience, credentials, education and expertise takes a lot of time and effort. You need to do your home work before you hop into your car and drive to your neighborhood plastic surgeon’s office for that consultation. You have to first check him out. You don’t want to end up with a botched surgery, more pain than you can handle or serious medical complications. These are the steps that I took in my search for finding a board certified cosmetic plastic surgeon in my area who specialized in tummy tuck cosmetic surgery. Before you begin your search for a surgeon you need to “get smart” about what a tummy tuck is, what others have experienced and what you can expect. Read books, talk to people and search the internet for information. Note – I clicked on all the relevant ads that I saw that promoted plastic surgeons. I figured if the surgeon could afford top placements in the advertisement listings, he probably has a quality website full of good information, even if he wasn’t in my area. Ask your family doctor to recommend a tummy tuck plastic surgeon in your area. Also, ask your doctor where to go and what to do to check up on the surgeon. Ask your friends if they know anybody who has had this type of operation. If they do see if you can contact them and then “pump” them for information and recommendations. Search the internet and check the yellow pages for listings of plastic surgeons that perform tummy tuck operations. Use online referral services like Angie’s List to find plastic surgeons in your area. Once you have identified a few plastic surgeons in your area, call their offices to see if they specialize in tummy tuck operations. If they do, make an appointment for a consultation. Go to as many consultations with different surgeons that you can. Each will provide you with different opinions, information and impressions to help you make your choice. Do a Google search on the doctor. Try to find everything you can about him or her. Don’t just type in their name. Do advanced searches using their name along with words like “malpractice”, “law suits”, “legal action”, “bad” and so on. Pay for at least one Medical Surgeon Physician Background Check Report. Get two reports from different online companies to get all of the information. Bring a list of prepared questions to your consultation. If the surgeon does answer all of your questions look elsewhere. Verify that the plastic surgeon is board certified. Verify that the plastic surgeon specializes in tummy tuck operations. 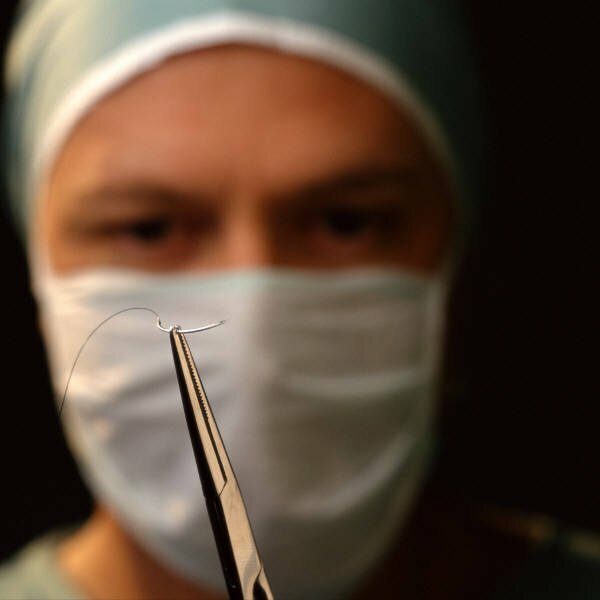 It might be hard and embarrassing but ask the surgeon how many of these operations he has performed and if he ever had any dissatisfied patients. Also ask him if he ever had any malpractice suits or legal judgments against him. Odds are you won’t ask him about the last question but you can still find out by doing a background search on him (step 7). Look at the surgeons “Before and After” pictures of his patients and ask for references to call. Remember that the medical facility where you will be having your operation is just as important as your doctor. As the doctor where your operation will be performed and make sure it will be full equipped and staffed to handle any emergency that may arise. Check out the facility for yourself. Your doctor needs to be board certified plastic surgeon and should have at least 5 years of experience in his/her own practice. They should also stay up on all current information regarding their trade. This means continuing education to keep their cosmetic surgery skills up to par. Remember, qualified plastic surgeons that are in high demand, demand high prices. To check to see if your tummy tuck plastic surgeon is really board certified visit the website of the American Board of Medical Specialties (ABMS). It’s free. On the website you will be asked to register with your name and email address. They instantly send you a confirmation email which allows you access to check out your doctor. To Verify Your Doctors Medical License. Run a Google search using the keywords “your state medical license verification” (insert your state’s name). To Check on Your Doctors Credentials and Disciplinary Actions. Run a Google search using the keywords “your state medical board” (insert your state’s name). To verify that your anesthesiologist is qualified to provide general anesthesia. Go to the American Board of Anesthesiology website and click on the link “Verify a physician’s Certification”. The American Board of Anesthesiology examines and certifies physicians who complete an accredited program of anesthesiology training in the United States and voluntarily apply to the Board for certification or maintenance of certification. To See if your Doctor is Permitted to perform care in a hospital or Clinic. This information is usually provided in the paid Physician Background Reports. If you don’t want to pay for a report, simply ask your doctor, then call the facility to verify (or check out the facility website). I started my search for a good tummy tuck plastic surgeon by asking my family doctor for a recommendation and received a few names, but they were not really recommendations, just some names that a few of his other patients had gone to. That didn’t help me much so I turned to the internet. I began searching for a “board certified” plastic surgeon who specialized in Tummy Tuck operations. I was looking for an established (not too young) plastic surgeon with many years of practice as well as an excellent reputation. A local surgeon would be preferable. A long distance surgeon would involve added transportation costs, hotels, dog sitters, more time and would just make things too difficult. I was fortunate to find a good plastic surgeon in my city. To check him out I searched the internet for anything I could find about him and his practice. I was particularly looking for the bad stuff (I wanting to stay away from any surgeon with any negative connotation). I also used two of those paid research companies that check out the backgrounds of surgeons and provide reports on their experience, education and to find if they ever had any legal actions filed against them. I also checked the local county records over the internet. Both paid reports indicated only good things about my plastic surgeon as well as his medical education and experiences. I could not find anything negative said about him. I drove by his office to get an impression or feeling and to check out his office facility. I then decided to make an appointment for an initial consultation. What Do Plastic Surgeon Background Checks Show? Any Legal Action or Professional Misconduct Against the Surgeon. Verification of Surgeon’s Board Certification Status. Review of Surgeon’s Internship, Residency And Fellowship Training. Academic Appointments and Hospital/Faculty Appointments. Physicians/Surgeons Special Interests and Area of Expertise. The Medical School From Which Your Surgeon Graduated. Publications Written By The Physician. Awards Received By The Physician. Surgeon’s Credential Overall Ratings Score. The following Reader Comments are relevant to the subject of this page. I really want to get a tummy tuck done but trying to find a good md that does payment plans is hard to find and i really want a good tummy tuck plastic surgeon (md) that would not mess me up. Finding a good tummy tuck plastic surgeon is a lot of hard work. Finding one that accepts payment plans is probably harder yet (though most will accept credit cards). Finding one that won’t MESS YOU UP – well, you won’t know that till after the surgery. That’s the scary part and hardest part of it all. The “not knowing” how it will turn out. The only you can do is research your doctor thoroughly and make the best choice possible. Surgery is always a gamble and there are no guarantees. Good luck. Now that you know all about how to find a good tummy tuck plastic surgeon, learn about Tummy Tuck Horror Stories.